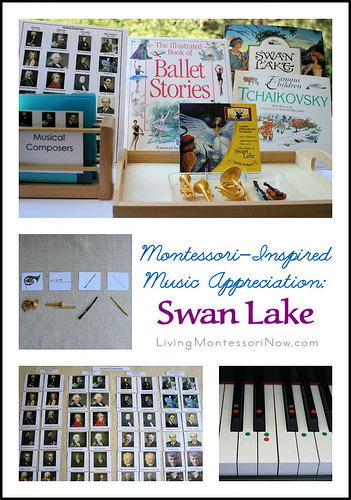 If you’ve followed my Montessori-inspired music appreciation series, you know that I love Maestro Classics. Maestro Classics is an amazing way for families to enjoy classical music together through stories and high-quality music performed by the London Philharmonic Orchestra. Disclosure: Maestro Classics is one of my blog sponsors. Previously, I received the complete set of Maestro Classics CDs. I’ve also received a number of the downloadable MP3/PDF titles. I recently received the MP3 and PDF for The Sorcerer’s Apprentice. 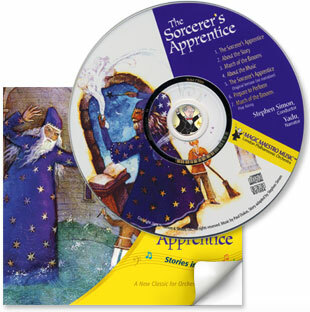 The Sorcerer’s Apprentice CD is $16.98 and the MP3/PDF is $9.98. The Sorcerer’s Apprentice can also be purchased as part of a Maestro Classics collection. A number of the Maestro Classics titles are recommended for ages 4+. The Sorcerer’s Apprentice is recommended for 6+ and families. I think that’s a great recommendation and fits with the Montessori principle of emphasizing reality over fantasy during the preschool years. The Sorcerer’s Apprentice could also be frightening for some small children, which is another good reason to save this title for older children in general. The Sorcerer’s Apprentice is a wonderful title, and you’re the one who knows your child best. The exact age of readiness will obviously vary among children. 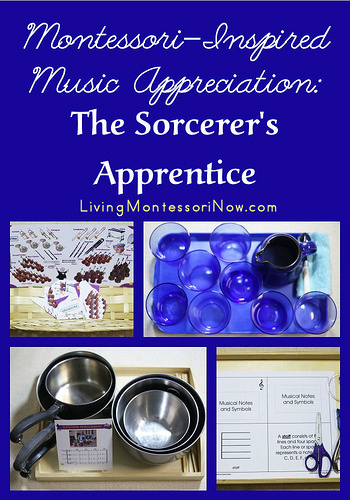 In the homeschool music curriculum guides at Maestro Classics, you’ll find a number of ideas for a unit study of The Sorcerer’s Apprentice. Those are wonderful ideas for elementary age and up. 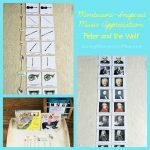 I’ll share some Montessori-inspired activities here for young elementary children and preschoolers who want to be included in a homeschool family study of The Sorcerer’s Apprentice. 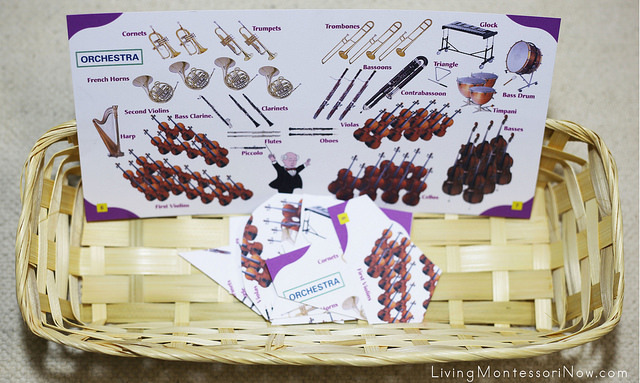 To prepare this activity, I simply printed out two copies of the orchestra pages in the PDF guide that came with the MP3. You can cut one of the copies into puzzle pieces in a difficulty level appropriate for your child. Your child could use the second picture as a control card for self-checking. The child could even assemble the puzzle on top of the control chart if needed. Before working with the musical notes and symbols materials, I’d recommend doing a featured instruments layout similar to the activity in my Montessori-Inspired Music Appreciation: Carnival of the Animals post. 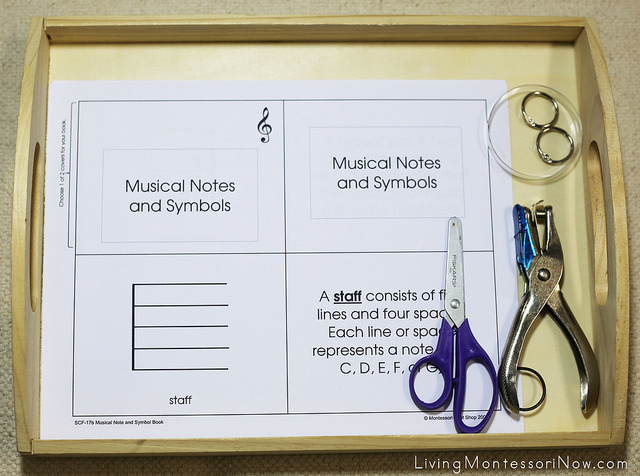 Creating a Musical Notes and Symbols Book would be a great Montessori activity after your children or students work with the Musical Notes and Symbols Cards from Montessori Print Shop. For a homeschool, you could make this activity very easily … simply by letting your child cut out and put together the book. I love this activity from the Maestro Classics Sorcerer’s Apprentice PDF booklet. 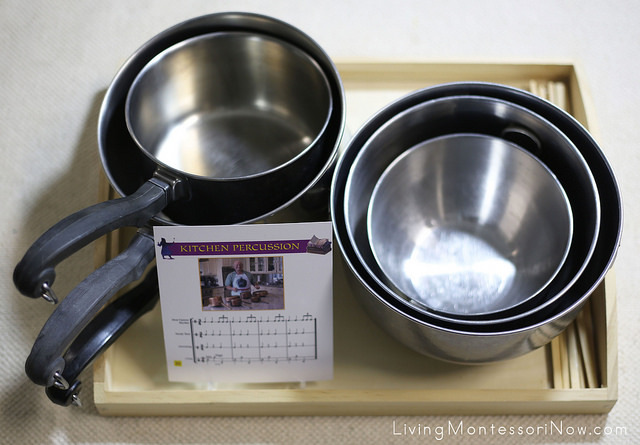 You can set out a variety of pots and pans and wooden spoons (or chopsticks like I used). 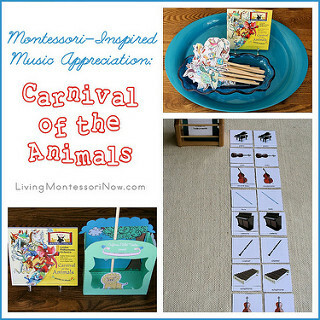 Then your child can try to duplicate one of the rhythms on the card printed out from The Sorcerer’s Apprentice PDF booklet or create his or her own accompaniment to the related track on the CD or MP3. 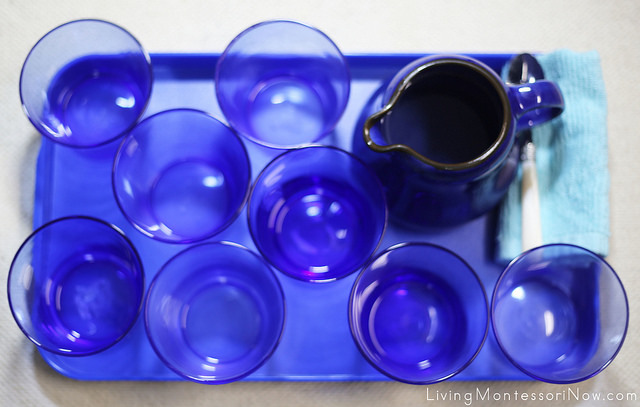 Making a glass xylophone is another fun activity from the Maestro Classics site. You can download a free PDF that tells you how to make a glass xylophone. 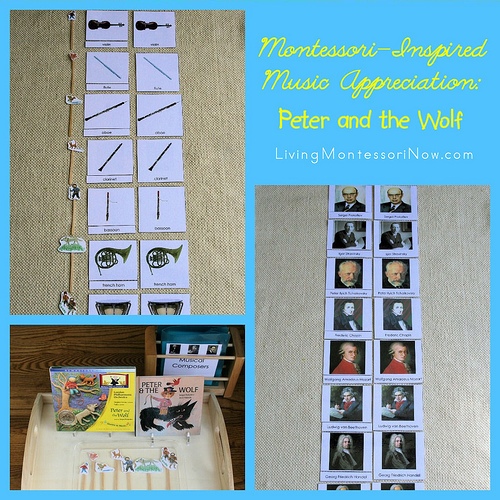 You’ll find Montessori-inspired Peter and the Wolf activities here: Montessori-Inspired Music Appreciation: Peter and the Wolf. 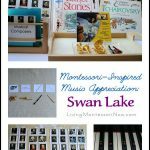 You’ll find Montessori-inspired Swan Lake activities here: Montessori-Inspired Music Appreciation: Swan Lake. 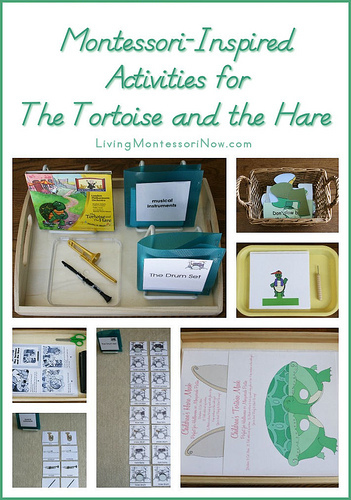 You’ll find Montessori-inspired Tortoise and Hare activities here: Montessori-Inspired Activities for The Tortoise and the Hare. 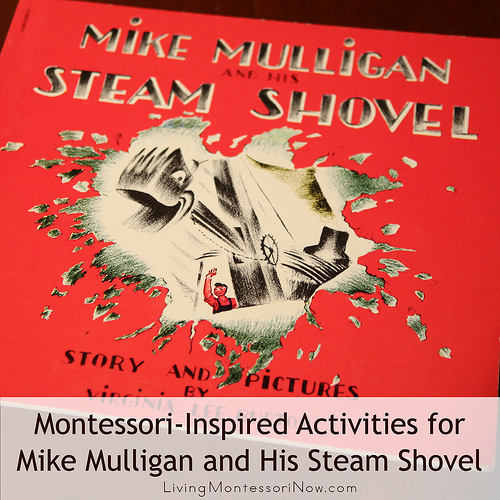 You’ll find Montessori-inspired Mike Mulligan and His Steam Shovel activities here: Montessori-Inspired Activities for Mike Mulligan and His Steam Shovel. You know, my daughter was terrified of Disney’s Sorcerer Apprentice when we tried to watch Fantasia with her. She hates characters in the movies getting in trouble and not listening to direction. I love your music appreciation series though and thanks for sharing with Afterschool! I love this! I am pinning it so I can come back and share with a friend. These are awesome ideas to go with Maestro Classics! I’ll be pinning this a couple of times. We’ll be getting a download or two this week and I’m sure some of these activities will come in handy for the kids. 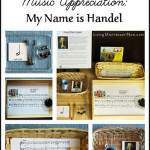 Thanks for linking up to Mom’s Library, I’ll be featuring you this week at Crystal’s Tiny Treasures. Such great ideas (as always)! I really need to make more time for music appreciation too. 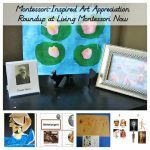 Featured you this week on Mom’s Library! Great idea sound like so much fun , and you can spend quality time with your family and near ones. Unbelievable! 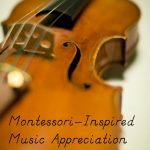 Amazing ways of making kids love music you’ve found. It made me smile for a while. Thanks so much! I personally love Maestro Classics. Classical music is the mother of all melodies.